Welcome on Sakura Fortune Slot! All set for a virtual tour into a Japanese world? But what does Sakura mean? Quickspin the software maven drew its inspiration from the Japanese cherry which also means sakura. And It’s no other than a cherry blossom! Along with this 5-reels and 40 payline video slot machine, you’ll find an incredible princess and she reigns over this spellbinding reels! As you spin them, she might help you in your quest for potential wins. Geared up? 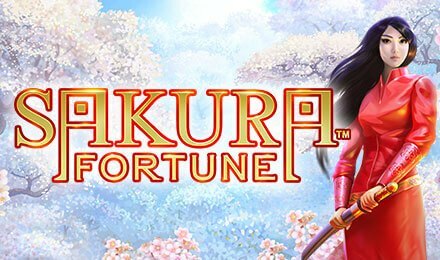 Sakura Fortune Slot is a special online slot machine which comes packed with riveting symbols that meet the expectation. In one word spellbinding. In each corner of the reels, you find a barrel of symbols like gold coins, an evil emperor, golden dragons, the princess Sakura amongst other exceptional symbols. An impressive well-designed game is at your fingertips! Bet Levels: There are no Bet Levels on this slot machine. Amount of Paylines Selection: But what about the 40 lines? They all remain fixed. Coin Values: You will find no coin values on Sakura Fortune Slot, there is only the Total Bet. The min bet is 0.20 and the max bet is 100.00. What’s the Princess Wild Symbol? It is a 4x1 wild scatter symbol which can pop up on the following reels: 2, 3, 4 in both the base game and the free spins. There’s a little surprise for you! It can act as both the wild symbol and the scatter symbol. The Princess Wild Symbol can replace all the symbols on Sakura Fortune Slot. The Bonus Scatter Symbol on Sakura Fortune Slot is the yellow fan and it can come into view in the Base Game only and do you know what? They are not bound to the bet lines. These symbols can be present on the reels. Try to get 3 or more consecutive Bonus Scatter symbols which start from the leftmost in the same spin to activate the Free Spins. The Sakura Fortune Respin can be activated by 2 full stacks princess wild. Now, when the feature is launched, the total number of respins relates to what? The number of wilds on the reels of Sakura Fortune Slot. In the event you get 2 full stack wilds, the Sakura Fortune Respin will be activated and you will enjoy 2 respins. Get additional wilds to wallow in additional respins. If there are no more wilds on the reels, the feature will stop. The Free Spin Feature can be triggered, here! On Sakura Fortune Slot, if you land 3 or more of the fan scatters in the adjacent rows starting from the left-hand side, you will be bestowed with a total of 7 Free Spins. Plus, each wild princess symbols that appear on the reels will grant you with extra spin. Is it not great? In addition, the wild symbols will expand to fill the whole reel.